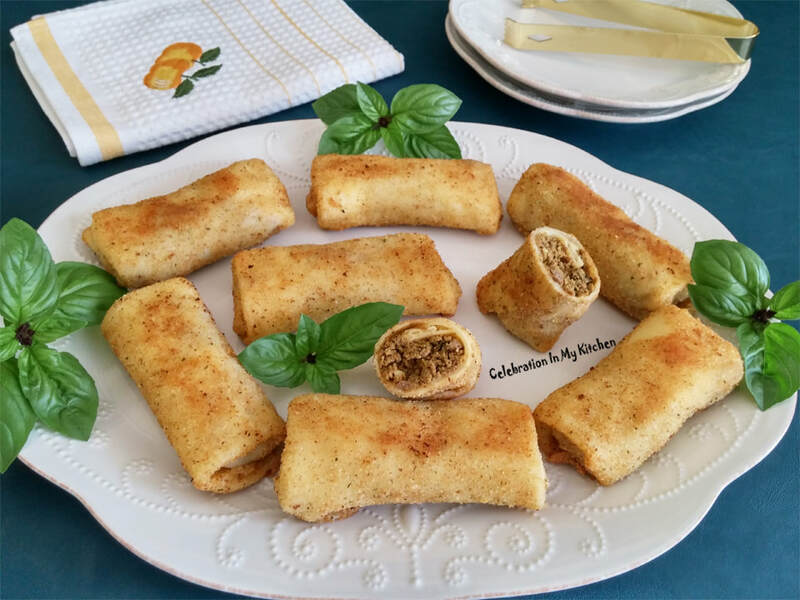 The pan roll is a savoury crepe or thin pancake with a filling of either minced meat, prawns or vegetables. 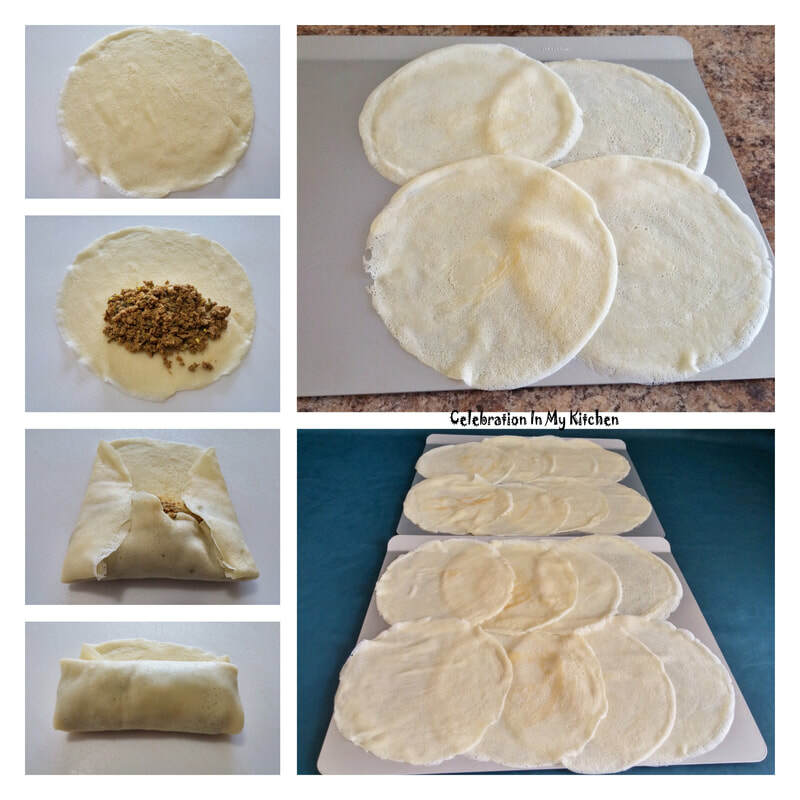 There are steps involved in making the pan rolls. Preparing the filling, making the crepes, stuffing them, rolling and then frying. Don't be intimidated with the various steps. Any leftover filling can be used or you can make the filling ahead. The batter is easy to prepare and each pancake takes a minute to cook. 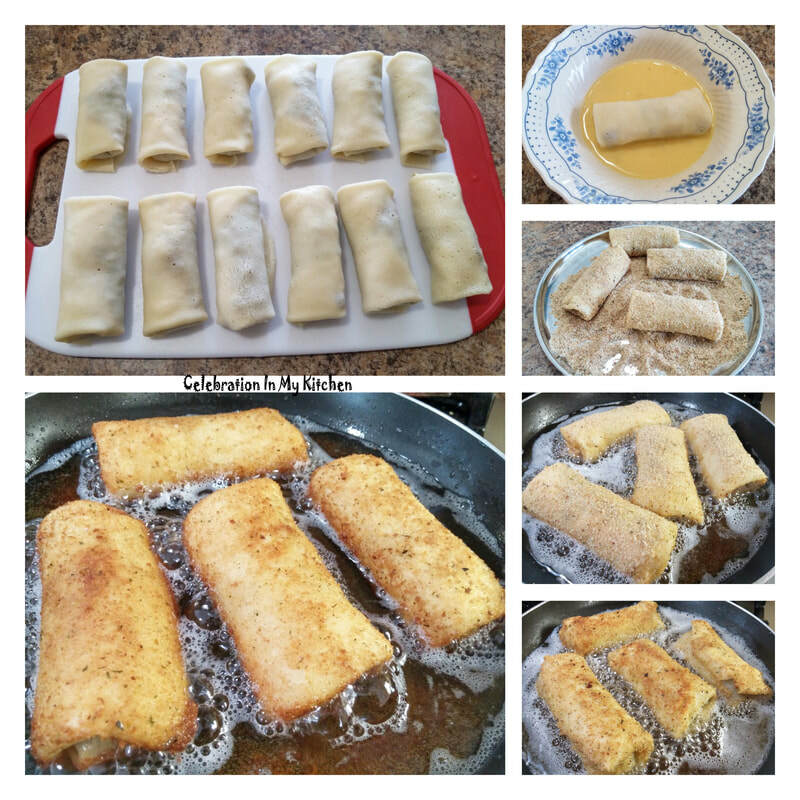 The filling used was chicken mince and with the soft crepe, the pan rolls were truly scrumptious. Worth the time and effort that went into preparing these delightful rolls. 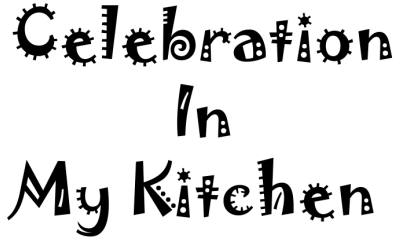 These are commonly prepared for special occasions and served as an appetizer. 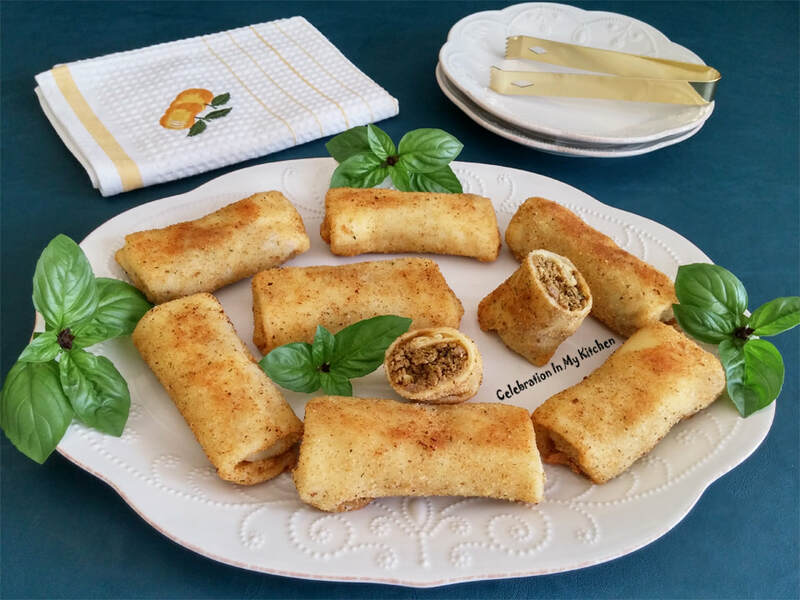 The pan rolls can be made ahead, frozen and then pan fried just before serving. They are so delicious that you just can’t stop at one. Try it to believe and relish!!! Heat oil in a pan and saute onions till soft. Add the green chillies, garlic, ginger and fry for few seconds. Then add the mince and fry nicely till it changes colour. The spice powders go next along with salt, vinegar and water. Cover and let mince cook on medium heat till all the moisture is absorbed. Finally, add mint and coriander leaves. Let the filling cool at room temperature while you work on the crepes. Sift the flour and salt together. Keep aside. 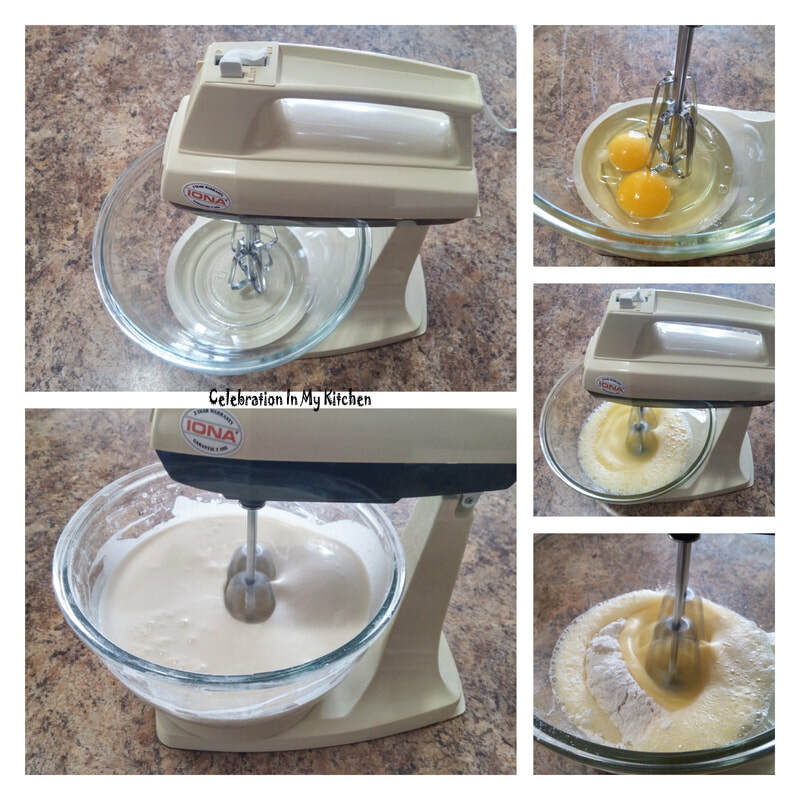 In a bowl, add egg and beat with an electric hand mixer (beater) or whisk. 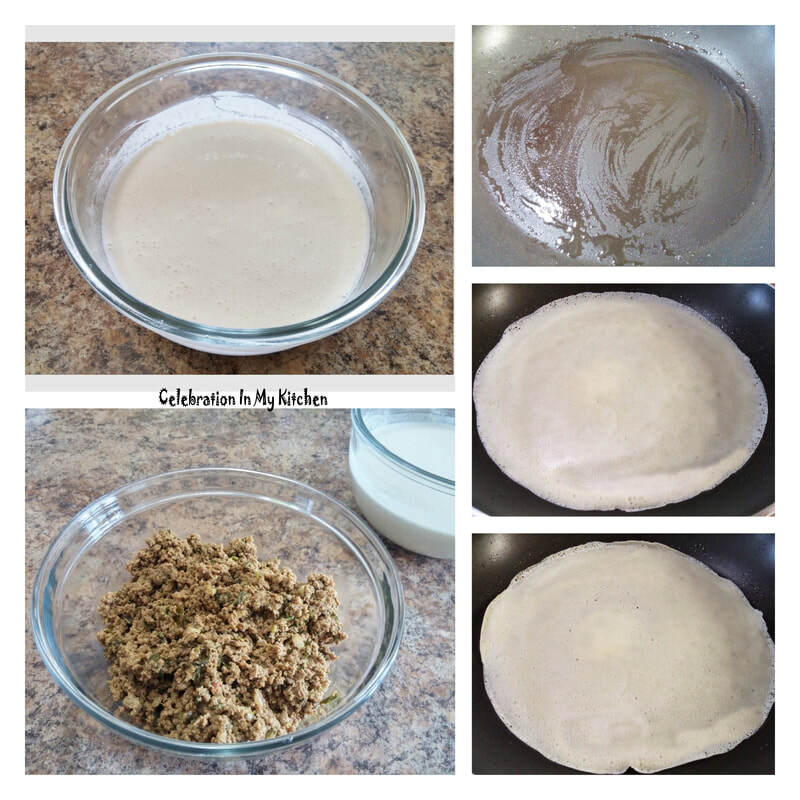 Slowly add in the sifted dry ingredients alternating with milk to make a batter of thin consistency. On low heat, place a 6” or 8" non-stick pan. With a silicon brush, lightly grease pan with oil. When hot, pour 1/4 cup (for 6" pan) or 1/3 cup (for 8" pan) of batter in the centre, tilting to spread and coat the base thinly. Cover with a lid and cook for one minute. The pancakes do not have to be flipped. They are thin enough to cook when covered. Remove pancake in a dish. Repeat the above process till all the batter is exhausted. Ensure to grease the pan after every pancake. Spread the filling on one side of the pancake. Then roll and fold both the sides inward (like a spring roll), continue to roll till the end. You don’t need to seal the edge. Beat the eggs with milk in a flat dish. Place breadcrumbs in a separate dish with a spoon. On medium flame, heat a skillet with enough oil around 1/4” to cover the pan. The pan rolls have to be fried on all sides so a little extra oil is ideal compared to deep frying. Dip each pan roll in egg then coat with breadcrumbs using the spoon. Handle pan rolls gently and place in hot oil. Fry on all sides till lightly brown. Remove and drain on absorbent paper towels. Serve warm. Pancakes made in a 6" non-stick pan will yield 24 and 16 in an 8" pan. 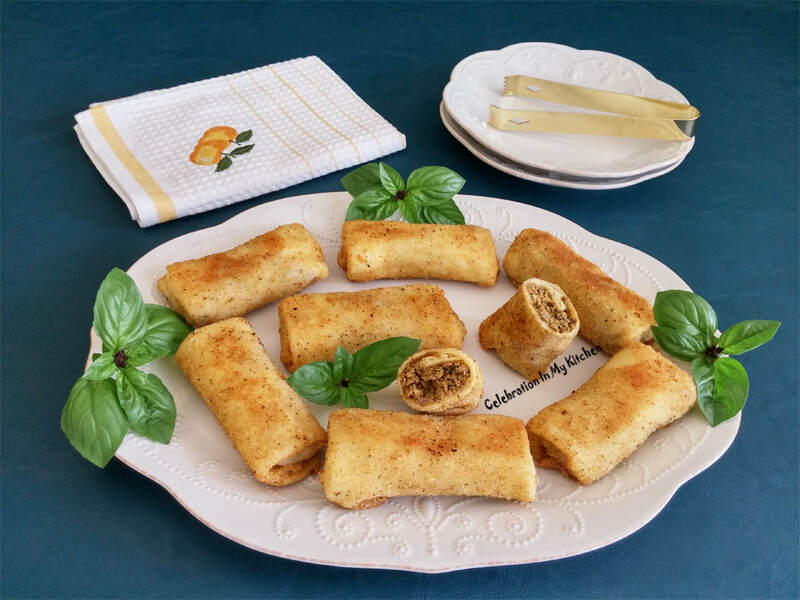 Italian breadcrumbs which had parsley and parmesan cheese were used to coat the pan rolls. Hence, you can see green specks on them.